On a purely qualitative basis there’s a couple of reasons why you might consider a long-term investment in supermarket giant Sainsbury’s (LON: SBRY). The first is that with around 150 years on the clock it undoubtedly has a long history of continuous trading. When you consider that well over forty of those years have been as a publicly traded company – Sainsbury’s shares first floated on the stock market in 1973 – it naturally gives you some confidence in the longevity of the business and its stock. The fact that many folks will also have regular interaction with a Sainsbury’s outlet via the weekly shop probably adds to the sentiment. The second reason is that the mainstream supermarkets technically operate in a defensive sector of the economy. You certainly wouldn’t be able to identify a recession from their financial data in the way you might with a cyclical stock since folks still need to buy food, drinks and household goods during economic downturns. Sure enough if you pull up the relevant financial data for Sainsbury’s from between 2007 and 2010 you’ll find that not all that much changed in terms of its underlying business. Revenue was stable and its annual dividend actually increased from 9.2p per share to 14.2p per share during that period. Unfortunately for Sainsbury’s shareholders these qualitative reasons don’t ever translate into the all important hard figures, the most significant of which is the free cash flow number. 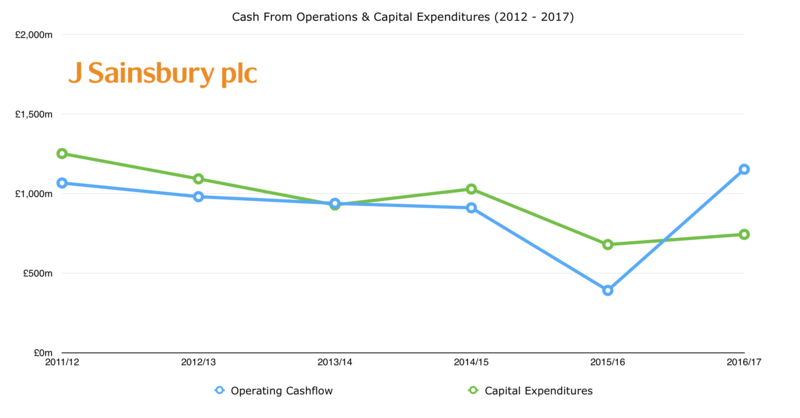 Looking over the past fifteen years’ worth of data shows that Sainsbury’s only generated positive values for free cash flow in eight of them. More significantly, in the years that free cash flow is actually positive, its ratio of capital expenditures to free cash flow is typically very high. In other words Sainsbury’s struggles to convert a high percentage of its stated profits into actual shareholders’ cash to use for things like dividends, buying back shares, paying off debt and/or buying other companies. Compare that to wholesale retailer Costco or Asda owner Walmart, both of which trade on the New York Stock Exchange. Like Sainsbury’s, and indeed like virtually all other supermarkets, Costco and Walmart are inherently low margin businesses. Between 2002 and 2016 Costco’s average operating margin was around 3.7%; a figure which is comparable to Sainsbury’s. Crucially though, and this is what separates them from the UK supermarkets, Costco and Walmart’s cash flow numbers are much healthier. Firstly, their cash flow generation is much more consistent (as far as I can see they have both generated positive free cash flow in each of the past fifteen years). Secondly, they tend to do a much better job at converting their profits into free cash flow. The upshot is that both have also generated higher shareholder returns over the past decade-and-a-half compared to Sainsbury’s and the other big UK supermarkets. This week Sainsbury’s released its annual results for fiscal year 2016/17. Group sales (including VAT) were up 12.2% to £29.1 billion, though this increase was mainly a result of the Argos acquisition which completed last year. Like-for-like sales were down 0.6% compared to 2015/16, with underlying profit before tax down by 1% to £581 million. Underlying earnings-per-share were down by around 10% to 21.8p which reflects the dilution from the aforementioned Argos acquisition. Likewise the full year dividend of 10.2p is set to be around 16% lower than last year’s. On the plus side free cash flow of around £350 million was enough to cover the dividend for the first time in years, whilst net debt was also down £350 million to just under £1.5 billion. All-in-all these aren’t a particularly great set of numbers, though on a brighter note Argos appears to be doing relatively well with like-for-like sales up 4.2% in the second half of the year. In addition the company are seeing particularly strong like-for-like sales growth in Argos digital stores attached to an existing Sainsbury’s supermarket. Sainsbury’s stores with an attached Argos store also saw a sales uplift of between 1-2% on the groceries side of things. Going forward Sainsbury’s now expects to have 250 Argos stores in its supermarkets by 2019, up from the current figure of 60, and the company expect a total of £160 million in EBITDA synergies to be realised by 2018/19. Argos aside one of the main issues with the core business is growth. Take the earnings and dividend figures for example. Twenty years ago Sainsbury’s earned 22p in full year net income per share and paid out a 12.3p per share annual cash dividend. This was in fiscal year 1996/97. Tony Blair’s New Labour hadn’t even had their landslide general election victory that’s how long ago it was. In fact the proposed 10.2p per share dividend for 2016/17 is lower than the 10.5p per share paid out in 1994. Bear in mind this isn’t even including the effects of two decades’ worth of inflation either. As far as investment returns go it’s obviously not ideal to have zero growth, but technically it needn’t be a disastrous issue so long as one crucial condition is met: the starting valuation has to be so low that it can compensate for earnings going nowhere for a long time. In an ideal world this would also include a fairly stable and high yielding dividend. Meet those conditions and you’ll find it’s perfectly possible to scratch out decent returns. So where are we right now? Well, as it stands Sainsbury’s stock is currently trading at around 13x annual profits. The proposed full year dividend of 10.2p per share gives the stock a current yield of 3.9%. Is that enough to make the shares attractive right now? Not particularly, but it’s arguably better value than both Tesco and Morrisons. The £10.3 billion worth of property that makes up the Sainsbury’s store portfolio should also provide a floor to the share price once you discount for liabilities such as debt. Ultimately the prospects for long-term growth look limited given the fiercely competitive nature of the industry. Discounted supermarkets like Aldi and Lidl continue to gain market share meaning that the other established names have little choice but to compete on price. In other words it’s going to be a tough long-term ask for Sainsbury’s to grow revenues and/or boost profit margins. Fundamentally though the main issue is that Sainsbury’s just doesn’t generate enough free cash flow, and the current valuation doesn’t do enough to make up for it. Should You Buy JD Wetherspoon Shares Right Now?